In celebration of Hollyburn Properties’ 40th Anniversary of building apartment rental communities, we wanted to give our valued residents a chance to win a 7-day, all-inclusive, Dream Vacation to Cancun, Mexico. To enter, we asked our residents to submit a video testimonial describing what they love about living in a Hollyburn building. To say the results blew us away is an understatement! Our team was overwhelmed with the amount of time, effort and creativity that went into every video submission. In fact, the production value of several videos was of professional quality – who knew! Authentic element – does the clip capture the genuine testimonial of the resident? Development of concept – is there a clear structure and theme? Compelling nature – is the clip inspiring? Does it catch the audience’s attention? Original and inventive – is the clip original in its content and format? In the end, only one video (and entrant) could emerge victorious. 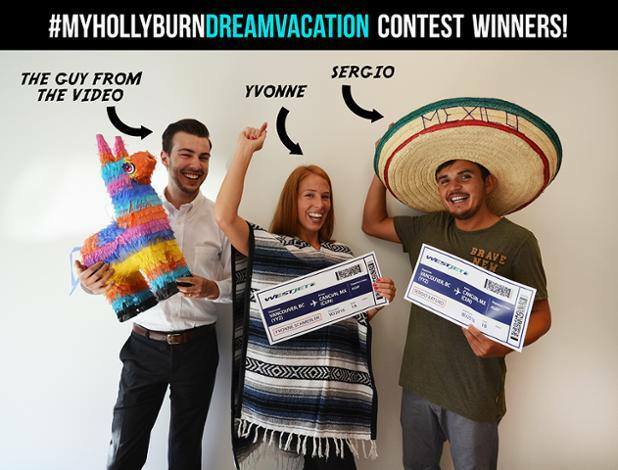 And so…after much deliberation, we’d like to congratulate Yvonne and Sergio of Vancouver, for winning the #MyHollyburnDreamVacation contest!! We loved how they captured footage over several weeks throughout the summer and turned it into time-lapse vignettes that really brought their message to life. Yvonne and Sergio, we hope you enjoy your trip, returning to the country where you met 4 years ago. Sigh…how romantic! We’d like to thank each and every person who entered our resident-appreciation contest. Didn’t win this time? Fear not, our 40th Year is not over yet! Stay tuned to our social media for an exciting announcement, coming soon! Check out Yvonne and Sergio’s full video here.